John Chester, VI Learning Coordinator from Middlesbrough, shares how he prepares technical materials for science lessons and how to help learners understand them. Currently I spend quite a lot of my material preparation time creating technical resources for subjects like Mathematics, Science (physics, biology and chemisty), and Mechanics and any others which may require a student to use more advanced braille notation (I have written for Insight before about the braille signs needed for Maths). It is vital to prepare learners with vision impairment (VI) so they understand and can use technical signs in lessons. On top of that, learners require a wide range of tactile diagrams, such as the periodic table or ionic compounds, and therefore need time to build up and develop diagram skills. This may involve time outside of Science lessons to practice these skills and receive guidance from the VI teacher and/or specialist teaching assistants. It’s recommended that you refer to guidelines for both Maths and Science signs, as they both come under the umbrella of UEB. UEB guidelines can be found on the UKAAF website (Guidelines for Technical materials) and Maths and Science guidelines are available in hard copy from the RNIB Shop (these are also available from RNIB Bookshare as downloadable PDF files). Maths and Science codes are used in tandem of course, as the subjects do not live in isolation. For instance, take units when representing weights or measurements. Using UEB for Science by the RNIB recommends that the given number and the unit are spaced. I agree with this, but I also think that if the student is capable, they should gain experience of reading and writing both spaced and un-spaced. This allows them to become more resilient as a braille reader, so that however something is presented to them, they will be able to read it. “The primary concern at all times should be the needs of the pupil. 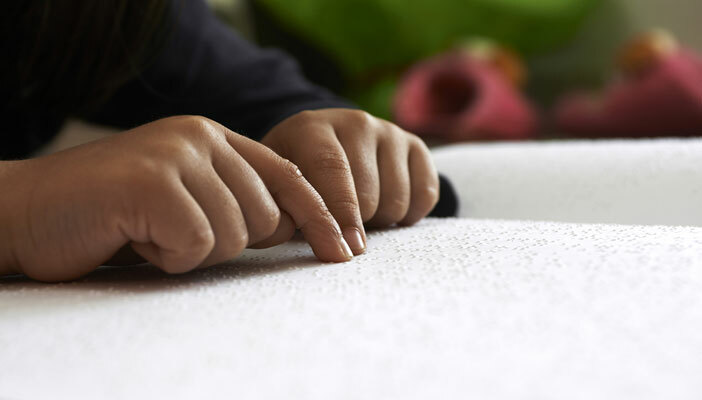 Their level of braille knowledge and science knowledge should guide the transcriber how to produce braille materials suitable for the individual pupil's needs. These needs are likely to change over the course of their educational progress” (Using UEB for Science, RNIB). Please refer to the accompanying image. Note: a grade 1 sign is used in example 1 otherwise "m" would mean “more”. As can be seen, the rules regarding units are straightforward. When introducing weight, capacity and volume (and area), the rules regarding sub and superscript need to be followed. Please refer to the accompanying image. In example 1, a lower “I” sign is used to denote superscript with a grade 1 sign before it, as there is a space after the 5. Without a space, it would read like example 2 (the lower “I” cannot be confused with “in”, as the numeric sign has also set grade 1 mode). These rules can be confusing to the learner and it’s important that dedicated lesson time is set aside when teaching these rules. Whether it is volume or area, or anything else, the rules applied here are the same with regards to spacing, the use of the grade 1 sign and the rules which dictate sub/superscript (more on this below). Please refer to the accompanying image. Note: the grade 1 word sign is used (it’s important to remember that grade 1 mode continues across the forward slash). Chemical symbols are quite straight forward. “H” in print is represented by an “H” in braille. It’s important to still remember rules regarding grade 1 mode and capital letter mode however. For example, if you were to write “H” on its own to represent Hydrogen in contracted braille, a grade 1 sign is needed to save it being confused for “have”. If it is used as part of a “string” and is not standing alone, then a grade 1 sign isn’t needed. For example, Al (aluminium) is also the braille sign for "also". Please refer to the accompanying image. Note: the use of sub and superscript signs. It’s important to ask yourself if a grade 1 sign is needed and/or if you would save space by putting a passage into grade 1 using the grade 1 passage indicator (remembering to also use the grade 1 terminator sign). For more information on the use of grade 1 passage indicator, please see section 1.7 of the Guidelines for technical material on the UKAAF website. Learning the periodic table is challenging for any learner, especially when it is in braille. Time needs to be given for learners to practice how they would note down different atomic structures from the periodic table. Please refer to the accompanying image. As in general Unified English Braille (UEB), subscripts are written before superscripts. The mass number is represented first using the subscript sign and the atomic mass, second, using the superscript sign. As mentioned, this takes a lot of practice. It’s worth setting learners a challenge to find different atomic symbols and write them out ensuring they represented them correctly using the correct signs in the correct places. Remember the grade 1 sign is a switch – it can be flicked on and off. Set aside plenty of time for pre-learning, recap and practice. Diagrams can be time consuming to create and there is such a wide variety needed for KS3, KS4 and the different Sciences. Check RNIB Bookshare, as many of the main topics are available on the website. Have plenty of guidelines to hand – layouts and formatting become complex quickly.